A multimission satellite Orbital ATK built for the GovSat brand operated by a joint venture of SES and Luxembourg’s government has arrived at the Cape Canaveral Air Force Station in Florida. SpaceX is scheduled to launch the GovSat-1 satellite by the end of January on board its Falcon 9 rocket, GovSat said Thursday. The satellite will employ X-band and military Ka-band frequencies on various mission beams that work to support multiple operations. 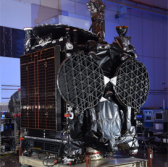 Patrick Biewer, CEO of GovSat, said the satellite’s payload is designed with encryption and anti-jamming tools built to help secure connectivity for government organizations and other institutions. GovSat-1 will be positioned at 21.5 degrees East orbital slot and serve customers across Europe, the Middle East and Africa.